Scholarship Provided by: Australian Government, Department of Education and Training in 2017. 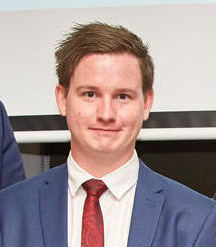 Joe is employed by the South Australian Government as a trainee Political Specialist. He moved across into this area after completing his training in Retail Management. He achieved Certificate lll in Business, Certificate lV in Retail Management and Certificate lll in Government. Last November he was awarded runner up Apprentice (trainee) of the Year in November 2016 for the Australian Training Awards. Prior to his entry into the political arena he was employed by IGA for a number of years advancing his way to Fresh Produce Manager. Joe is an excellent communicator who is passionate about helping others and wants to dedicate his life further to achieve this. His community activities have been numerous including Volunteer Country Fire Service at Hahndorf, Kiwanis Club fund raising, Volunteer at the Hinely Street, Encounter Youth Green Team. He is a qualified scuba diver which he loves. Since achieving his Trainee of the year award, he is an Ambassador for the Vocational Education and Training sector. Joe comes from a large family of 12 children, 8 sisters and 3 brothers. He plans on fulfilling his scholarship in the U.K. since their political scene is close to ours and he has already made contact with the Australian Consulate in London. Ready to Embark on Your Journey? All whilst learning things you enjoy overseas.